This month’s LoveLula beauty box is worth £44 and it’s such an amazing value for money as it costs only £12.50*! As always, there are some great products in the box and my favourite must be Madara AHA Peel Mask which is a full-size product, worth £20 on its own. 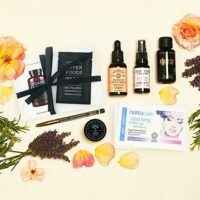 LoveLula Beauty Box is a great way of discovering new green beauty products and brands, perfect for those who are new to natural beauty products. To see what products were in March’s box click here and for my opinion of February’s box click here. To get your LoveLula beauty box in May go to this page. This brightening AHA peel mask carries Ecocert logo and it contains 99% of natural ingredients with 7% of ingredients from organic farming. It provides an instant radiance with a super dose of nature’s active fruit acids for bright, radiant and soothed skin. I’ve used this mask once so far and it left my skin feeling smooth and soft. I was worried that it would cause irritation but it didn’t. This mask is not suitable for those with hypersensitive skin though – that’s what it states on the packaging. It benefits people with dull, tired skin and those with lines and wrinkles. It also helps acne sufferers and those with age spots. This face cream is more suitable for mature and dry skin as it promotes collagen and moisture retention. It contains powerful antioxidants of Rhodiola and Ginseng to protect skin from the environmental ageing. This is not something that I will be using as I don’t think I need it, so I will be passing it to my sister for testing. The eye serum from the luxury Italian skincare range is light and contains a potent blend of active ingredients that help to reduce the appearance of fine lines and wrinkles. Just to mention that this serum contains a preservative called phenoxyethanol which some people like to avoid. This is a lovely body wash which foams well, I much prefer this one than the one from Greenfrog Botanic which came in February’s LoveLula box. From my experience, natural body washes don’t foam well but this one is an exception and I am happy to recommend it. It leaves my skin nice and soft without drying it. It has a pleasant fruity scent and contains no Parabens, SLS, Phthalates and alcohol. It’s also suitable for vegetarians and vegans. In summary, I love it! This natural handwash is made from organic soapberries, grown sustainably in the Himalayan Mountains. It’s suitable for sensitive and dry skin. It doesn’t foam much but it leaves the skin soft and hydrated. If you are a green beauty fan and want to subscribe to LoveLula beauty box click here. It’s only £12.50 a month (£13.95 from June), including the postage. You can cancel your subscription anytime. And remember, every month you will get 20% off on all the brands found in the box. This looks great. I hadn’t heard of this before but it looks like it has some fantastic products. Yes, LoveLula beauty box always contains some great products. Not all of them will be suitable for your skin type but you can always give them away to your friends/family. You get lots of travel sizes and samples as well which is great for long weekends away or when you go on holiday. LoveLula beauty box is a green beauty box which I am happy to recommend.